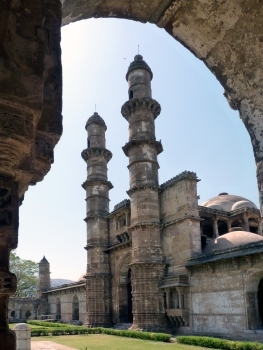 The Champaner-Pavagadh Archaeological Park holds a largely unexcavated city which has been built in the late 15th / early 16th century as the capital of Gujarat. It is an early Islamic, pre-Mughal city and its architecture shows the transition between the Hindu and Muslim traditions. The designated area includes over 100 monuments, including fortifications, water installations and different standing structures. At the top of the hill is the temple of Kalikameta. There are also five mosques that are in excellent state. Some of them are forerunners of the Mughal architecture, being a mix of Hindu traditions and craftsmanship with Moslem ideology. The most significant of them is the Jama Masjid, also built by Sultan Begada. If any site in India should be de-listed it is Champaner. Unlike Manas which I find has no more value left, this inscription makes a mockery of any kind of buffer zone and management plan requirements. There is definitely value here and I enjoyed what I saw, a massive fort area that covers the two prominent mosque, several tombs and city walls, a hill that I didn't visit because there was a festival and I think the driver wanted to avoid getting stuck in traffic for hours (or an excuse), definitely value. However, even 7 years on since the last review nothing has changed. It has been inscribed for 13 years now. The slums are still inside the archeological park, the trash keeps piling up and we get charged 600 rupees for two mosque entries. The best part of these are the carvings but you will admire it for 20 minutes max and it is not as spectacular as other carvings in India. The good news is that the road from Vadodara only take 40 minutes now, and if you want another approach you could get off Godrah junction and find a ride from there. I took an Ola for 1,400 half day outstation trip, with the driver coming sightseeing himself. Interesting enough there was NO guide service touting at either mosque. I expected a lot more from this and scheduled half a day else I would have rushed to somewhere else for the afternoon but instead I spent more time in Ahmedabad. I think a message should be sent by putting this site on the in-danger list to get the state party moving. The count on this Web site under “most visited sites” for Champaner was a mere 2 visits before we added our 2 from this February. That places Champaner as the least-visited Indian cultural site among our “community”. I wonder why? Even Els on her current epic RTW journey didn’t make the relatively short detour from Bhopal on an overnight train to Vadodara but went straight on to Delhi! As its title indicates, the site consists of 2 main elements, albeit within a single boundary in the form of the “Champaner-Pavagadh Archaeological Park” extending to over 1300ha (c5sq miles). It contains remains of human occupation from the Stone Age but the main sights relate to Hindu religious and military remains on the hill of Pavagadh, which still operates as a Hindu/Jain pilgrimage destination, together with the remains of the city of Champaner situated below the hill. This was, for a brief period in the late 15th/early 16th centuries, the capital of a pre-Mughal Islamic kingdom in Gujarat. It is particularly important for the quality of the architecture – both in its own right and for its significance in the development of an Indo-Islamic style. The city became deserted after Humayun (he of the tomb in Delhi!!) defeated the Gujarat kingdom in 1536. 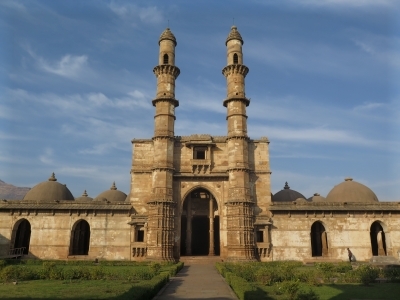 The Champaner part of the site is situated around 90 minutes by good road from Vadodara (“Baroda”). There is then a road part way up Pavagadh hill from where you can either walk to the top or take a cable-way – we had a car, but a shuttle service of local taxis connects the 2. From what I gathered, many Western tourists don’t bother with Pavagadh Hill which, in architectural terms, doesn’t really offer anything special (we were the only Westerners I saw on the day we visited). However the view from the top and the “pilgrimage aspects” make it worthwhile doing so in my view unless you are very short of time. We had (unknowingly!) chosen to visit on a puja day and there were thousands of Hindus from all over Gujarat making the pilgrimage to the temple at the top of Pavagadh mountain.. This meant that we had to queue for around 45 minutes to get on the cable car and then for a similar time at the very top to pass through the temple (though not to come down luckily!). But it was all very good natured with a holiday atmosphere together with decorated holy cows and all the other sights of a Hindu pilgrimage. As we boarded the cable car we tried to forget that 7 people had died and others had been rescued by helicopter in an accident on the ropeway in Jan 2003! Champaner was completely different – all the Indian visitors turned off at the bus/taxi stand up to Pavagarh and the site was almost deserted. There are city walls which are nothing special compared with those of many Indian forts. We concentrated on 2 of the Mosques (both pay-to-enter using the same ticket). The highlight is undoubtedly the Jama Masdid (photo - with Pavagarh Hill in the background). In 1484 the Gujarat Sultan Mahmud Bagada captured Pavagarh Fort from the local Hindu ruler of the Chauan dynasty which ran “Rajput” kingdoms across various parts of N India. He immediately set about building his new capital there using local architects and sculptors to interpet his “muslim requirements”. The result is certainly very fine and very “Indian”. The site in some ways reminded me of Bagherat in Bangladesh – another former capital where now only the Mosques provide an indicatiuon of what once has been there. 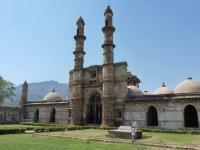 At Champaner too there are various mosques together with pavilions etc scattered over a wide area. The Palace ruins are supposed to be on the way up to Pavargarh but we didn’t see them. The ICOMOS evaluation of the site in 2004 was pretty negative and recommended “Deferral” both on the grounds of lack of a proper management plan and because OUV hadn’t been demonstrated (though it didn’t suggest that this couldn’t be done). So what did the WHC do – inscribed it immediately on criteria iii, iv, v and vi!! The Nomination file and the evaluation talk of the “living village” situated within Champaner ruins as if that were a plus point! Those who know India will understand what it really means – all human activities taking place and piles of rubbish etc lying around! Our guide was adamant that the inscribed area consisted solely of the monuments at Champaner but the on-site maps of the “Champaner-Pavagadh Archaeological Park” and the Nomination file make it quite clear that the mountain with its pilgrimage path, fort and summit temples is also included. But on the mountain there was absolutely no indication that the area was a UNESCO WHS – this was your typical Hindu pilgrimage site with all its myriad of traders and ad hoc developments. Inside the walls of Champaner, the first sign that one is at a WHS is the office at the Jama Masjid collecting the R250 entrance fee for foreigners and – yes, a sign commemorating the UNESCO inscription, albeit placed next a to a rubbish container shaped like a huge rabbit! I have just been reading the UK T List panel report which indicated that any site wanting to consider getting onto the list must have Management Plans etc well in place before even considering applying for a T List spot. In India , and elsewhere in the developing world, a more pragmatic approach is often taken. In 2004 it would appear that UNESCO felt that it would have more leverage on India to produce the necessary plans if it actually inscribed the site. It therefore added the following request for “the Indian authorities to monitor the implementation of the Management Plan and submit a report by 1 February 2005”. In 2005 the request was repeated in a bit more detail with a 2007 deadline. In 2009 the WHC “Regrets that the State Party did not yet finalise and adopt the management plan, developed with full involvement of the established management authority, and built around a Statement of Outstanding Universal Value, to ensure the integrated conservation of the property”. So much for that strategy!!! Unless you were particularly interested in the development of Indian/Muslim architecture or like us, were “collecting WHS”, Champaner doesn’t offer a great deal which is “special”. However, if Vadodara isn’t too much out of your way during your Indian trip, I would recommend taking it in. The late 19th Century Laxmi Vilas Palace in that city provides an amazing insight into the lives of the Maharajahs under the British Raj and some of the tribes around Champaner are worth visiting if your guide has an entrée. I am not entirely sure why India went for the site. Clearly Gujarat wanted a cultural nomination – but there are more significant ones elsewhere in the state. 2 are on the T List including possibly the most important one - the Indus valley city of Dholivara. But I suspect they require a lot more work to be done on them to bring them to a state suitable for inscription. Champaner clearly doesn’t meet the requirements even now!! yes,actually i am living in Baroda and the pavagarh is about 60 to 70 km from my place. I visited pavagarh and especially the world heritage sites many times. First time when i visited the champaner i had no idea about its vast and glorious heritage but when i interact with writings and some great statistics about the champaner i feel that it is our pleasure to see,watch,believe and feel about champaner's glorious past.Now taking care of this heritage is become our prime work. Thank you. Goddesses: "The traditional Hindu explanation for the (Pavagardh) hill is that it was formed from the toe of the goddess Sati, a previous incarnation of Kali. Sati, the faithful consort of Shiva, was angry when her father slighted her husband, and in protest, killed herself. To prevent the mourning Shiva from going mad with grief, Vishnu cut up Sati's body, the parts of which fell to earth." Multiple Religions: Hinduism, Jainism and Islam. Pavagadh hill is a Pilgimage site for Gujeratis from all 3 religions. The Kalika Mata Temple is Muslim/Hindu and there are also Jain temples.